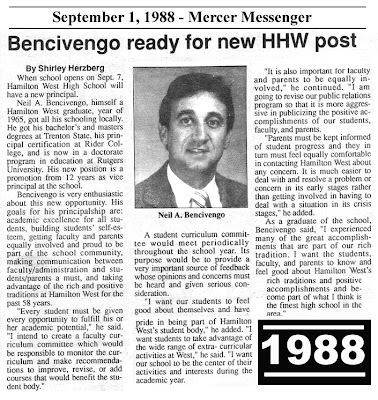 HERE'S THE ARTICLE ANNOUNCING THE APPOINTMENT OF NEIL BENCIVENGO AS PRINCIPAL OF THE BEST HIGH SCHOOL IN MERCER COUNTY. 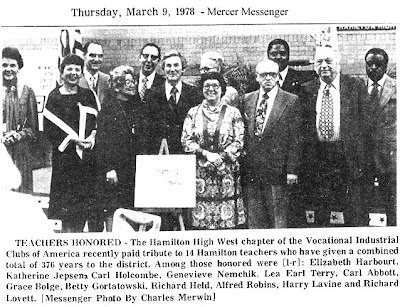 AS WE ALL KNOW, NEIL WENT ON TO BECOME THE SUPERINTENDENT OF HAMILTON SCHOOLS. 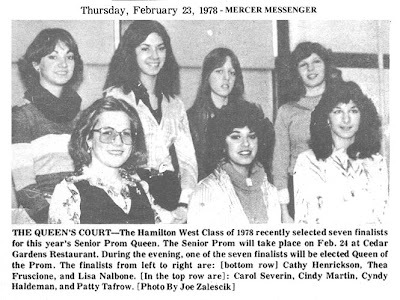 I'M SURE THE JUDGES HAD A HECKUVA HARD TIME CHOOSING THE PROM QUEEN FROM THESE LOVELY LADIES. ANY BY KNOW WHO WAS THE FINAL CHOICE? THERE THEY ARE, SOME OF YOUR FAVORITE HHS FACULTY MEMBERS CELEBRATING THEIR LONGEVITY AS TEACHERS IN THE BEST HIGH SCHOOL IN THE UNIVERSE. DON'T MISS THE 70'S STYLE HAIR DO ON NORMALLY CREW CUT CARL ABBOTT. VERY COOL, CARL! 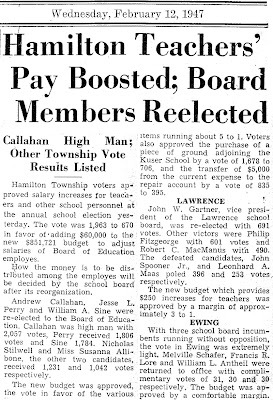 INCIDENTALLY, AS I WRITE THIS ON FEBRUARY 1, 2008, CARL ABBOTT IS STILL BRIGHT EYED AND BUSHY TAILED, HAPPILY VOLUNTEERING FOR THE FRIENDS OF THE HAMILTON TOWNSHIP PUBLIC LIBRARY AND ALSO FOR THE HISTORICAL SOCIETY OF HAMILTON TOWNSHIP. 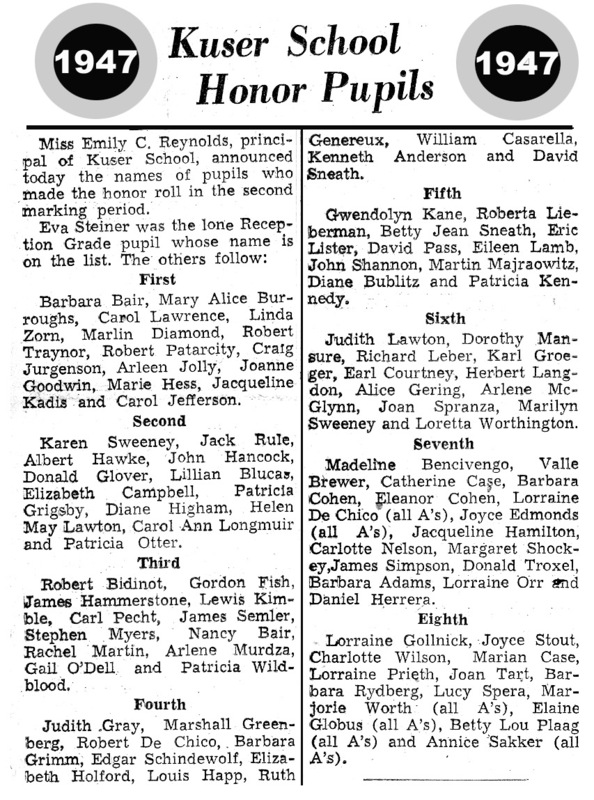 1947: THAT "GOLDEN WAVE" WAS REALLY GOLDEN! ONE OF OUR ARCH RIVALS BACK IN THE GOLDEN YEARS OF HAMILTON HIGH WAS THE VERY TALENTED GUYS FROM TRENTON CATHOLIC. 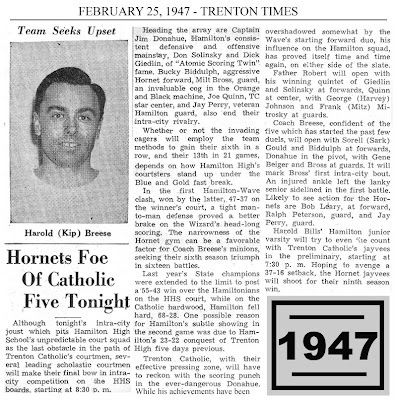 THERE ARE MANY FAMILIAR NAMES ON BOTH OF THOSE TEAMS, NOT TO MENTION THE VERY POPULAR HAMILTON COACH, "KIP" BREESE. 1953:HERE COMES NUMBER 55 FOR HHS '53! FROM MY NEIGHBORS JUST UP THE STREET IN THE 50'S DECADE AT HAMILTON HIGH, BOB POKSAY SENT THIS NOTICE AND GRAPHIC ANNOUNCING PLANS FOR THEIR 55TH REUNION. Tom - I sent this out to Class of '53 as an advance notice of our 55th reunion. Thought you might be interested. 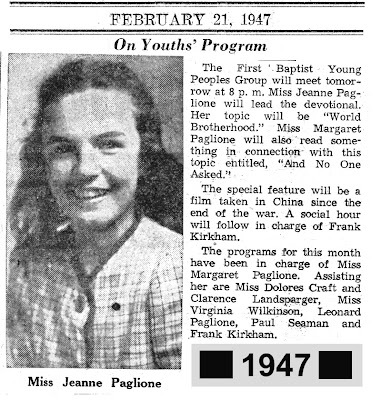 Photo from 1953 yearbook, Hunting and Fishing Club. Look closely at what Harry Olynk has in his hand. What do you think would happen today if someone brought a .45 caliber handgun to class? How times have changed. 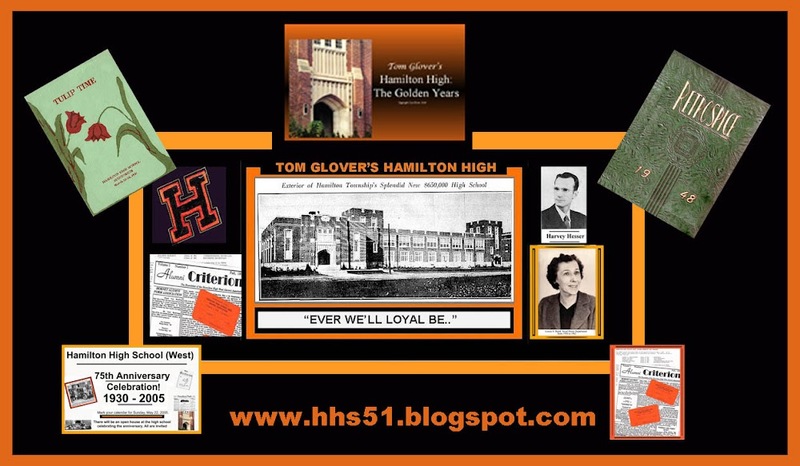 To relive the good old days, plan on attending the 55th reunion of the HHS class of '53 to be held October 17, 18 and 19, 2008. 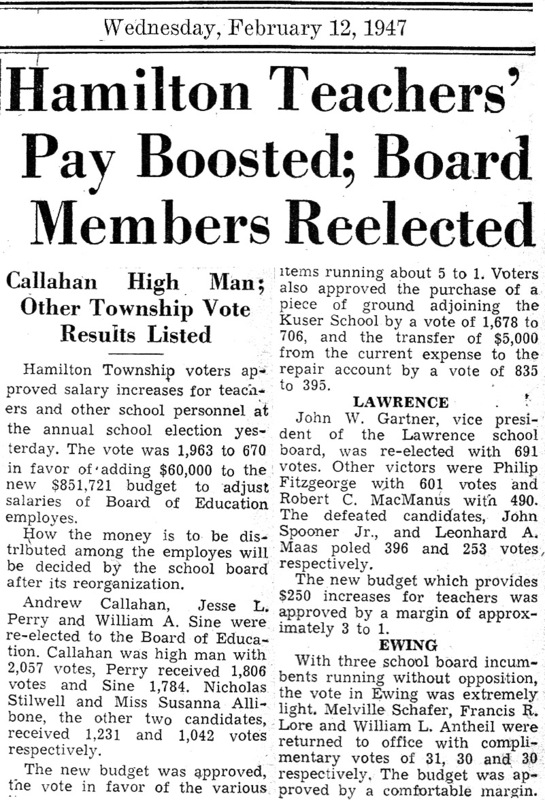 HERE'S A BIRDS' EYE VIEW OF THE POST WAR FINANCIAL SITUATION IN THE BOARDS OF EDUCATION FROM HAMILTON, EWING AND LAWRENCE. INTERESTING!